Smart Forms was initially presented in SAP Basis Release 4.6C primarily as a tool for the creation and maintenance of forms within the SAP solutions, for instance within mySAP Healthcare, mySAP SRM, mySAP CRM, and mySAP SCM and these are being used already by many customers. These Smart Forms offers an easy-to-use graphical user interface which enables the users to perform critical tasks of creating and adjusting forms without the need of any programming skills. Q) What are the key benefits or advantages of Smart forms? Smart Forms allows the overall implementation cost of SAP solutions to be reduced as the forms can be adjusted in minimum time. The Form Builder along with integrated graphical user interfaces meant for designing pages, table design and text, provides support to the entire process of designing the form and thus leading to the creation of the form logic. To add further, the Form Builder also offers a tree structure meant for navigating through your form description and helps in determining the main processing order. Of Besides these, other functions such as copy-and-paste and drag-and-drop are also included. The Smart Forms generates a function module which condenses the content, layout, as well as form logic by utilizing the form description which is maintained in the Form Builder. Thus avoiding the need to group of function modules for printing of forms. Besides the tool itself SAP also enables the generation of the set of forms meant for central business processes, which even includes forms in Financial Accounting (FI), SAP Customer Relationship Management (CRM) and Human Resources (HR), the SAP R/3 Sales and Distribution (SD), and application components. Q) How can we build Web forms using Smart Forms? Smart Forms can be generate HTML based on XML output, with the help of the SAP Web Application Server 6.10. This permits the integration of interactive Web Forms in Web applications. The layout of a Web Form is a look alike of the printed version. Printed forms which are already used in a business process are promptly recognized. By turning a switch the existing Smart Forms used for printing can also be reused for Web applications. Without showing them in your printed version, you can add HTML input elements to your Smart Form. For evaluating the user entries on a Web Form, these are required to be integrated in some kind of Web application infrastructure. SAP suggests you to utilize Business Server Pages for doing this. Q) In which situation u prefer & in which Situation u prefer IDoc? IDOC is used whn data container used to exchange information between any two processes that can understand the syntax and semantics of the data. Q) Which Basis Release do I need to use SAP Smart Forms? As of R/3 Basis Release 4.6C, SAP Smart Forms is available. It cannot be used in Basis Releases before 4.6C as it uses SAP kernel technologies and these do not exist in previous releases. Incase you deploy the appropriate kernel in a, for instance in, 4.6B system its impossible to use Smart Forms as the tools were still under development around that time. Q) Have heard that Smart Forms replaces SAPscript. What does the term "replace" mean? Replace does not mean that the SAPscript has been removed from the Basis shipment. Even as of Basis Release 4.6C, SAPscript remains a part of the SAP standard and as of now there are no plans to remove it. In fact, few transactions of SAPscript are reprocessed by SAP Smart Forms (for instance in the graphical or font maintenance). 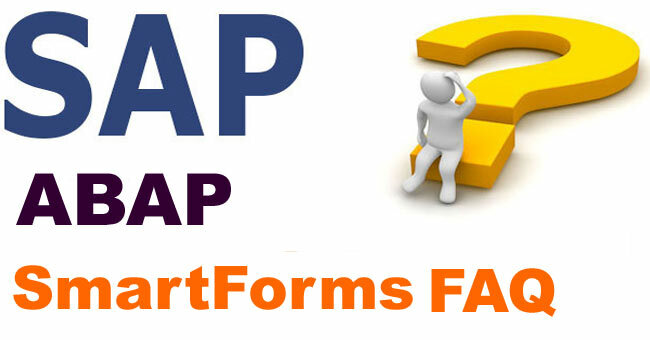 Since Smart Forms is presently the tool for form maintenance for mySAP.com solutions,we will focus on Smart Forms, and not on SAPscript (of course, we will continue to support the existing functionality of SAPscript for the maintenance contracts.) The term "replace" mirrors the hope that you will like Smart Forms as quite a few customers already do and use it instead of SAPscript. Q) Is it still possible to use SAPscript instead of SAP Smart Forms? Yes, we encourage our users to begin using SAP Smart Forms especially the new forms however both the products can be used parallely. Q) Where can the user get documentation on Smart Forms? Q) Where can the user get documentation Web Forms? The Smart Forms online documentation as of SAP Web Application Server 6.10, can be found in the section Web Forms for Internet Application. Q) Is there are any books on Smart Forms? Yes, you can easily buy German book on Smart Forms at Galileo Press. You can find out more Information about this book. Q) Does SAP offers Smart Forms training? Yes, the training id and title is: BC470 - Form Printing Using SAP Smart Forms. For more details, you can see our On-line Training Event Catalog. Q) If there is a possibility to migrate an SAPscript form to a Smart Form? Smart Forms offers a migration tool specifically for this purpose which migrates layout and texts of a SAPscript form to a Smart Form. It does not migrate SAPscript form logic of the print program. This logic is described by the tree structure of the Form Builder Using Smart Forms. The effort involved in migrating solely depends on the complication of the print program. You can also refer to the section Migrating SAPscript forms of the Smart Forms online documentation. Q) Do we have to migrate all SAPscript forms to Smart Forms? It is pointless migrating all SAPscript forms which are already in use as the SAPscript can still be used and will be available in the future. Incase you plan to migrate a SAPscript form, then it is suggested that you check whether the benefit is worth the effort involved. Q) Can I know if there are already standard smart forms for my application? Incase not, then what can do? SAP Document 430621 provides an overview of the existing standard smart forms which are delivered by SAP Applications. Besides this, SAP Labs also offers preconfigured Smart Forms which are specifically for the US customers. SAP Document 412293 also provides a procedure in case your application has not delivered a standard smart form. SAPscript presents a Raw Data Interface (BC-RDI) which permits the usage of 3rd party printing tools, which if meant for passing form content (without layout information) from R/3 to an external product. Smart Forms also provides a data stream called XML for Smart Forms (XSF) only for this purpose. As RDI, XSF does not comprise of any layout information about a Smart Form. You have the opportunity of becoming a certified partner for the XSF interface (BC-XSF), with the SAP Partner Program. You can refer to the SAP Integration Scenarios / Interfaces for more information about all certifiable SAP interfaces. For details about BC-XSF choose mySAP Technology: Background Processing and Output Management. Upon using an XSLT program Smart Forms XSF output is also the precondition generating HTML by This program utilizes the layout information from your form (for instance pages, used fonts and window sizes) and the given XML tags of XSF for generating HTML. Q) What are the differences between SAP Scripts and Smartforms? SAP Scripts are client dependent whereas Smartforms are client independent. SAP Scripts require a driver program to display the output whereas in smartforms the form routines can be written so that it is standalone. Q) How can I insert symbols in Smartforms? Choose the SAP symbol that you want to insert. Q) I have a smartform which works fine in DEV. After transporting it to PROD, there is no Function module generated for this smartform. As a result, my program dumps in PROD? The Smartform that is created in the Development may not have the same name in the Production server. So it is always advised to use the Function Module SSF_FUNCTION_MODULE_NAME to get the Function Module name by passing the Smartform name. ENDIF.How can I make the Smartforms to choose a printer name by default? In the CALL FUNCTION of the Smartform Function Module, set the output options parameter to set the printer name. The output options is of the type SSFCOMPOP which contains the field TDDEST. Set the TDDEST field to your default printer name. Q) How can I make the Smartforms display a print preview by default without displaying the popup for print parameters? Set the OUTPUT OPTIONS parameter TDDEST to your printer name. Q) How can I display the total number of pages in Smartforms? I'm using the variable SFSY-FORMPAGES, I get a star "*" instead of the total number of pages. Q) What are the various text formatting options in Smartforms? Q) How can I provide a background shading to the table? In the Table Painter, you can specify the color and shading for the table lines. Q) Where can I provide the input parameters to the smart form? The input parameters for the smartform can be defined in Global Settings->Form Interface. The Associated Type must be defined in the ABAP Dictionary. Q) Where can I define my own global types for the smartform? The types defined here will be global through the entire smartform. Q) I have defined my own Program Lines, where I have used a global variable G_TEXT. I get an error G_TEXT is not defined? Whenever using the global variables in the Program Lines, enter the variable name in Input Parameters if you are going to use(read) the variable. If you are going to both read/write the variable value enter the same in Output Parameters. Q) I have created a table node for display. Where can I check the condition which must satisfy to display the table? The conditions can be defined in the Conditions tab. In smartforms all the nodes have a condition tab where you can specify the condition to be satisfied to access the node. Q) How can I define Page Protect in Smartforms? Q) What is the difference between Template and Table in Smartforms? The Template contains a fixed number of rows and columns, where the output is fixed. Q) Where can I define the paragraph and character format for the smartforms? Q) How to add watermark to smartform output? Go to the properties of 'PAGE', tab 'Background Picture'. Add the graphic image name here. Q) How Can I Print Continous Text in SMARTFORM? Q) How many split we can do using cl_gui_splitter_contianer? or how max alv grid i can create in a splitter container? How to input buttons like pushbutton, Radiobutton will insert in a smartform? Also, where i have to write function codes regarding buttons?? However, you can insert radio buttons or check boxes into Smartforms (by using Symbols in text editor). How to explicitly call a page after a table? it is not possible to create a Smartform without a main window..